During World War II, the defense industry boomed in the San Fernando Valley. According to Greg Hise in his book Magnetic Los Angeles Planning the Twentieth Century Metropolis, the population of the San Fernando Valley grew 64% during the war. As a consequence, the housing industry also boomed. Private real estate developers transformed the landscape of the Valley into highly subdivided complete communities. 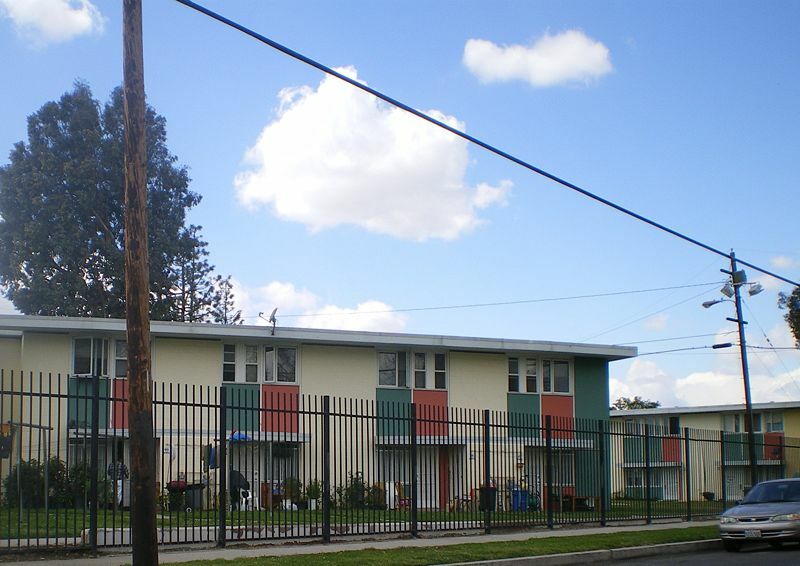 For example, Kaiser Community Homes located its new project in Panorama City, by the Lockheed Airport. The choice of the site was mainly determined by the proximity of industry, such as General Motors, seen as potential employers of the future inhabitants. Kevin Roderick reveals in The San Fernando Valley America’s Suburb that the project of Panorama City was to build three thousand units of ready-to-move-in houses. The two bedroom dwellings came with a garage, a standardized floor plan and all the necessary fixtures for the price of $3,690. Thus, contrary to popular belief, the Valley was not a bedroom community where all commuters were going back and forth from the Valley to their work place in Los Angeles. Promoters were determined to create a community for “living, work and play” (Hise 187). Housing was surrounded by school, recreational spaces, churches, commercial centers, and regional industries. “More than one hundred new industries within fifteen minutes”(Hise 187) was one of the most successful selling slogan of the Kaiser Community Homes. The houses were typicallly one level ranch style tract homes. In comparison with pre-war housing, Kaiser Community Homes was maximizing floor plan flexibility. Promoters intended to create more spacious units with fewer small rooms. One of the main characteristics was the relocation of the kitchen into the rear part of the house to improve privacy and the ability of the housewives to watch their children play outdoors (Hise 201). Three bedrooms and duplexes were also available for a price range of $9,000 to $15,950 (Hise 201). The key to the Kaiser Community Homes project was the standardization of the floor plans and the parts. However, standardization was also their main disadvantage. Hence, to reduce monotony, the promoters curved the streets, varied the location of the garages, and used different façade paint colors (Roderick 126). 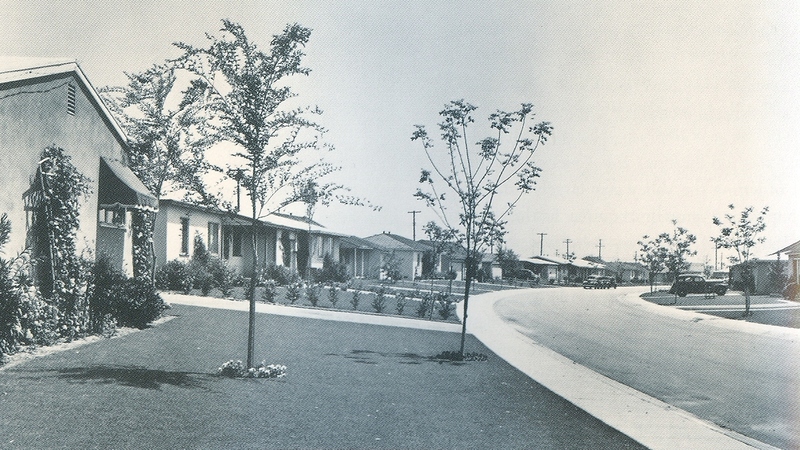 In 1946, the Los Angeles Planning Commission joined the effort against the concept of a “bedroom suburb” in the Valley by creating a zoning ordinance to locate “self contained communities as nuclei for urbanization” (Hise 192). Since the intervention of Kaiser Community Homes in Panorama City, the desire to create complete communities in the San Fernando Valley has remained a constant preoccupation of developers. 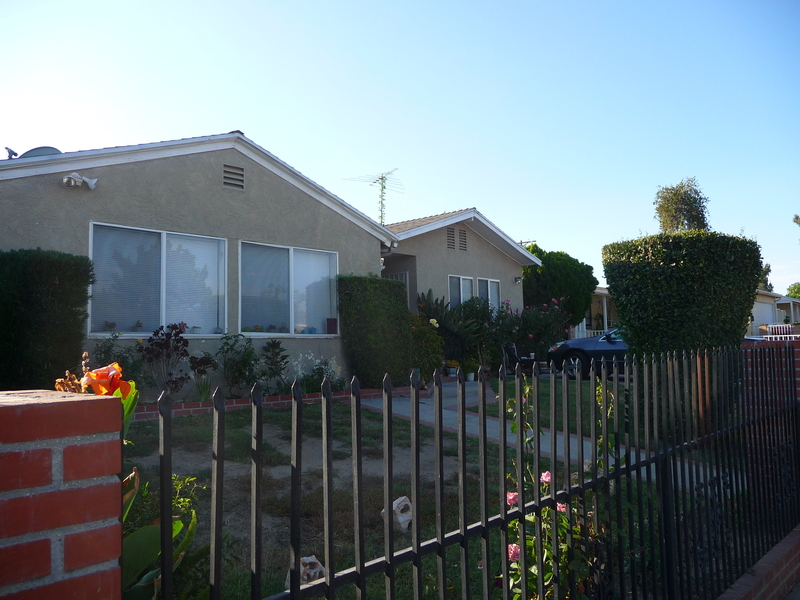 Picture 2: Houses in Panorama city have similar features as the one on the previous picture. Today we recognize the structure of the houses built in the 40’s, and notice the signs of mass production. Although housing projects have been associated in recent decades for housing low income, minority populations they were originally built, following FHA guidelines, to house primarily low income, Anglo populations. The San Fernando Gardens, built during WWII to house workers at the nearby Lockheed Plant, was one of the few exceptions to that rule. It was racially integrated from the start, housing the San Fernando Valley’s emerging African-American population among other groups. Today it houses mostly low income Latinos who are primarily Mexican immigrants. The ‘Gardens’, as the residents call it, are meant to provide “safe rental housing for eligible low-income families, the elderly, and persons with disabilities” according to House and Communities Government website. The projects is also home to something else, the Pacoima Project Boys. This gang consists of over an estimated 300 members and is the most violent street gang in the northeast region of the Valley. Analysts and critics point out that crime relates to social or economic status, so it might help to look at the conditions and hard realities that these families face on a daily basis. Upon entering a project, one might get a feeling of unease or even a chill due to the existing conditions of these so called ‘homes’. Although public housing has been used to house the unfortunate over the past decades, it can often seem like a harsh environment. Public housing is usually a large building structure that has open space located in the middle acting as a backyard for these units. The front-back relationship is often two facades that are identical with walls that have very small openings for windows. These small windows are designed for security proposes but also affect the amount of lighting and ventilation that enters the room. Very much alike in concepts with gated communities, windows are often fenced off in order to keep out “unwanted” visitors. Since crime and gangs are such a big part of the projects even the landscaping is strategically placed around the exterior of the building for security reasons. Bushes and trees are placed by windows and entrances to try and secure the premises as best as possible. The building is usually painted with two tones of neutral colors to manipulate the façade into being more complex from what is really there. These types of homes work opposite of suburban communities, in which the densities of these buildings are very high and often located right next to strip malls and factories. While common homes average in size of 2000 square feet, the projects would have units as small as 750 square feet. Falletta, Liz. “East Los Angeles Public Housing.” Delirious la. 2001. 10 Nov. 2008 <http://http://www.deliriousla.net/ar334/ar334tour-housing.pdf&gt;. “HUD’s Public Housing Program.” Homes and Communities. 28 Nov. 2007. 10 Nov. 2008 <http://http://www.hud.gov/renting/phprog.cfm&gt;. The Mission San Fernando Rey de España exists today as one of the oldest buildings in the San Fernando Valley. The Mission was established in 1797 by Father Fermín Lasuén. Like many built before it the mission was one of three primary architectural components used to establish permanent ground in order to successfully begin colonizing the surrounding area. The presidio, pueblo, and mission made up that infrastructure. Having only the mission in San Fernando Valley, it was primarily used to become self sufficient; cultivation and farming was its main goal in order for it to thrive. Construction of these massive earthen buildings was relatively simple and efficient. Using sun baked blocks to construct its adobe façade, the interior space inside stays at a relatively cool temperate feel. 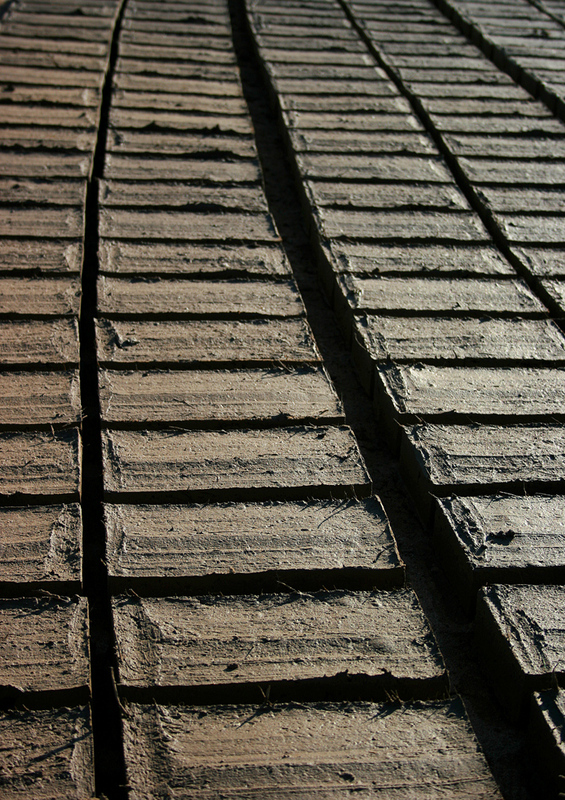 The adobe blocks absorbed much of the outside heat. Adobe was the most suitable building material for areas where there is minimal rainfall and excessive hot heat weather. The Mission San Fernando Rey de España was considered to be one of the very first permanent built structures in the San Fernando Valley. Housing shelters like these and many more to come were built with materials and construction methods typically known as ‘Vernacular Architecture’, that is – virtually all materials used to make this building are literally taken locally or even derived from the very earth and soil that it sits on. The idea of vernacular architecture is especially important today as we pay particularly close attention to things such as low impact products on the environment and low carbon output when dealing with today’s architecture. Through its early and innovative use of local materials, this building became the ultimate in green and sustainable architecture before its time. The Housing organization during the Mission period reflects the desire of the Franciscans to convert the Native population to Christianity and to the “civilized” life style of the Spanish Crown. The mission San Fernando Rey was built in 1797. It was composed of a small chapel, a main church and the main living area: the Convento. The massive adobe structure was 243 feet long and its façade was embellished with twenty one Roman arches. While the clergy was enjoying the comfort of the Convento, Native Americans, according to Carey Mc Williams in his book Southern California An Island on the Land, were treated as “the lowest level of humanity”(24). Men were used as free labor, and women were kept under confinement. Indeed, they were enclosed in the monjerio, a seventeen yard long and seven yard wide barrack made of adobe bricks. Bunks were disposed along the walls, and the sewer in the middle of the room was used as latrine. The only ventilation sources were narrow windows out of reach (McWilliams 32). The lack of hygiene, to which Indians were not used, led to the spread of infections responsible for a large percentage of the deaths of this period. Native American men were not usually prisoners of a building space as were the women, but they were still discouraged to escape through even more vicious techniques. The living conditions imposed to the Native Americans by the Padres inspired feelings of despise between both parties. Native Americans, who used to live their lives with the flow of nature without any kind of rigid form of organization, were seeing every aspects of their existence, what they ate, where they slept, where they were allowed to go, who they were allowed to see, etc. , dictated by the Padres. Even though, their lifestyle in the Mission led them to spend a lot of time outside, they were now forced to exploit nature for its resources, instead of living in harmony with it. Douglas Monroy, in his book Thrown Among Strangers The Making of Mexican Culture in Frontier California, states that during the Spanish period, the ranchos were depicted as places of “grace, honor and pastoral affluence”(115); however, in the early Mexican times the ranchos were not examples of material comfort. The adobes were initially two room houses. The living room, la sala, and the bedroom were shared by the whole family. Beds were made of twigs and leaves, blankets were made out of hides and sheets were rare (Monroy 115). The Don was the lord of the family and the head of the Rancho. The land was managed by the Mayodomo who directed ten to twenty Vaqueros, usually Native Americans who learnt Spanish and were good equestrians. The rest of the work was performed by uneducated Native Americans. The Rancho housing organization mirrored the mutual dependency between the Indians and the landowners. Even though the gente de razon looked down on the Native Americans, they needed their labor. On the other hand, the gente de razon were the main source of food for the Native Americans. The opposition of status that was established between the gente de razon and the Native Americans was a way for the first ones to establish their social status as elite (Monroy 138). Thus, thanks to the labor of Native Americans, Ranchos progressively accumulated wealth. The main house was an adobe house organized around a central corridor and a patio. The entrance of the adobe was characterized by a large porch. The main core of the house, located in the front part, was organized around a front hall. Family members’ bedrooms and living areas were adjacent to this hall that led to the rear part of the adobe. The rear part was usually organized around a central rectangular patio that gave access to additional bedrooms on one side, and to servant areas on the other. The far rear part was dedicated to the Don offices. After secularization, Ranchos became very important to Californian production. The main house was considered as a business center. 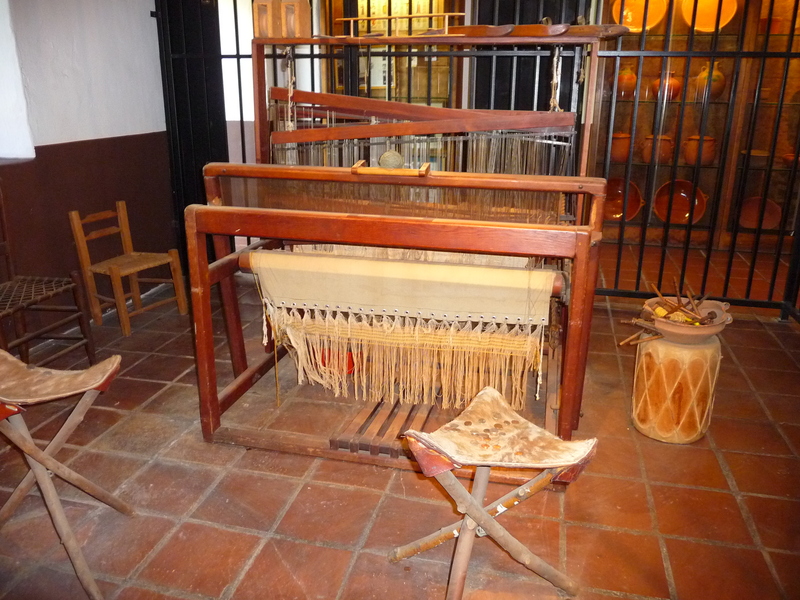 In some Ranchos, up to one hundred Native American laborers were supervised by the Mayodormo and organized into small manufactories of “wool combers, tanners, shoe makers, seamstresses, washerwomen” (Monroy 101). The front porch was used as the main place of production because it was the cooler and the most ventilated area of the house. 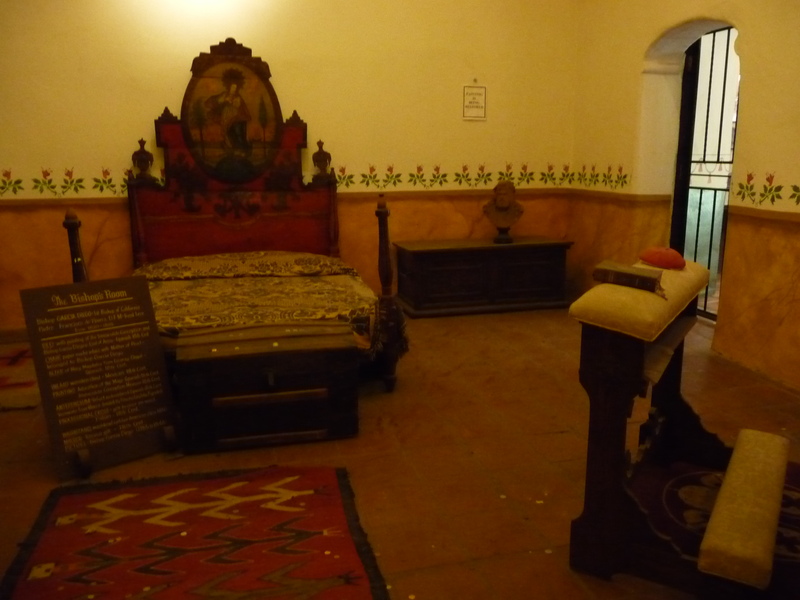 However, some Ranchos also had their own individual production rooms. A separated stone structure was used to put the cattle and house the Vaqueros (Monroy 113).The Native American who worked in the Ranchos lived on the Rancho land in the indiada, structure near the main house, or in houses “made of tules or sticks stuck vertically in mud and then thatched” (Monroy151) by the herds. In Rancho Ex-mission San Fernando, the Mayodomos had their own Adobe House juxtaposed to the Main House (or Convento). Thus, during the Mexican period, the Ranchos establish the pattern of social and economic relationships in the San Fernando Valley. Isolation, fear, shared interests and privatization are all aspects of life that share a similar role when analyzing a gated community. Separation from the outside world, by means of a wall, is not a new concept. In ancient Rome, walls were erected to protect its citizens from all forms of warfare and violence. Similarly, today within Southern California walls are being erected to protect groups of citizens typically of equal economic means. The gates today, although appearing at first glance to represent the ideals of the ancient Roman walls remain both physical and psychological manifestations of a barrier. Two pieces of literature, the first Tortilla Curtain by T.C. Boyle and the second Fortress America: Gated Communities in the United States by Edward James Blakely and Mary Gail Snyder dissect the world of gated communities. Through the introduction of two opposed families, to a detailed background of the gated communities, the two works open up what living in this type of urban environment entail. Tortilla Curtain is a story of the dualism between two cultures, the immigrant family roughing it in the wild next to the Anglo family housed in a new middle-class community. Boyle analyzes the lives and structure of the husband and wife within each of the two families including the hardships they encounter. For the Anglo family, the main problem to face is dog-eating coyotes, where as for the immigrant Mexican family, coyotes are the least of their worries. Within the text, Boyle depicts how both of these families are actually dependant on one another to maintain their own lifestyle. The demographics of the neighborhood make it vital to keep permanent contact with the very people they are attempting to keep out. The Anglo families within the gated community form a dependant relationship with their hired manual labor force employed to maintain their lifestyle. The walls, or barriers brought to life within this text show both physical and sociological notions of what keeping someone out actually entails. The barrier lying between the Anglo and the immigrant families appears blurred. Essentially the message from Tortilla Curtain is one that defines this notion of a Wall and acceptance. In Fortress America, Blakely and Snyder describe the gated community as an idealized and “safe haven” apart from the rest of the urban ills that occupy cities such as Los Angeles. Within this book the authors begin with a brief history as to the reasons and operations of walls (primarily for fortification and protection). It is important to notice here that some of the same reasons from the past are still given in present day, to keep your family safe. This issue is one that has troubled the United States for decades, how do you keep yourself safe from the world outside your door? Fear, the main culprit of the gated community is an issue that surrounds the inhabitants both in and outside the gates. This fear is perpetuated with the erection of the very wall built to protect the community. The wall: a physical barrier that represents protection from outside urban ills, acts as a reminder of safety for the inhabitants within the community. As viewed within Tortilla Curtain, the people the community is attempting to keep out are the people the inhabitants depend on for their daily needs. Blakely and Snyder go through the process of how a gated community is established and how control plays a role in the system. The development has a need for controlling access, creating a HOA (homeowners association), focusing the community inward, and isolating the inhabitants from the outside world. According to this article there are the 3 P’s associated with marketing a gated community; Privacy, Protection and Prestige. Within these communities the inhabitants tend to be of the same social background and all desire similar things in life (nice car, 2.7 children, a dog named skip and a white picket fence). It is important to mention similarities, because within these gated communities it is sameness that allows regulations of what color to paint your house, what car can be parked in the street, what sports are played and what type of shingles line your roof to shape the environment for its inhabitants. According to a U.S. Supreme Court magistrate “the phenomenon of Walled cities and gated communities is a dramatic manifestation of a new Fortress America mentality.” Keeping people out of these communities is only one of the worries that trouble the inhabitants, what comes next? In the beginning of the 20th century, William Levitt re-looked at the concept of subdivisions and took them to a new level. This new concept, which would cut construction costs by means of mass producing and standardization, introduced Levittowns. These new homes were intended to provide middle class families the opportunity to purchase single family residences. However, according to anti-sprawl critics, these new developments would “threaten to destroy open space, consume agricultural land, drive up utility costs, undermine social urban life, heighten inequalities, deplete natural resources, and damage the environment” (Bruegmann 3). Although the suburbs were heavily criticized, people still left cities by the thousands and headed over to the suburbs. After WWII, Los Angeles witnessed its population increase from four to eight million people. Since then, the size of houses and residential subdivisions have grown exponentially. Due to heavy criticism of suburban layouts, developers are now trying to improve the social and environmental conditions of the suburbs by creating a sense of community using different methods. One method commonly used is restoring or creating a city center. These city centers allow for specialized shops that include exterior circulation in order to give it the feeling of an urban environment. Another method that is becoming popular is the revitalization of green space. Although suburban sprawl has been most notorious for the land it ‘destroys’, these new developments allow for protected rural and natural areas. These new ideas might not recreate the suburbs, but could revitalize them, turning them into what they have continually contradicted: individual city centers.